Though the terrain is often steep, Dominica has fertile soil, abundant rainfall and a tropical climate excellent for growing fruit and other agricultural produce. There have been periods in Dominica's history when it has been the breadbasket of the region. A wide diversity of crops thrived. At one time Roses were in Dominica in a big way, with lime plantations for their cordial and marmalades. 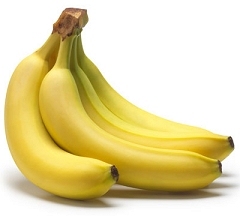 The banana is a very versatile fruit, easy to peel and eat, very nutritious, rich in potassium and the B vitamins. It is good for concentration, stress, heartburn, morning sickness and is believed to improve our body's resistance to many illnesses, prostate cancer being one of them. Even the inside of the skin is used to treat warts and insect bites. It is a crop which is not seasonal, therefore supplies are fairly constant throughout the year. It does not require replanting, for new plant suckers grow out from the root of the adult plant, which is then chopped once it has produced its one bunch of matured fruit. The new plant takes between 9 and 18 months to mature, depending on the precipitation, quality of soil and use of fertilizers. 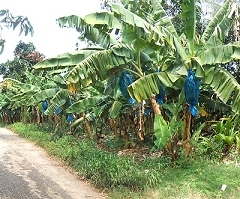 In the 1950's, whilst under British rule, Brits at home were becoming increasingly partial to bananas and Dominica was identified as one of several ideal locations for banana production. Prices were good and many farmers were lured into abandoning their other crops in favour of growing bananas. Soon the landscape became dominated by this one crop. For a period farmers prospered handsomely, but it was not long before two big American farm barons, Dole and Chiquita, also increased their dominance of the banana business in a big way. They concentrated more on the tropical Latino countries of South and Central America, which have vast areas of flat fertile soil, undervalued currencies and an abundance of cheap labour. Soon the price of bananas began to fall and these two giants came to monopolize and control the world market in bananas. Ever ambitious to increase their market share, they were unconcerned about their impact on small nations like ours with a high dependency on this one crop. The four tiny Windward Island nations (Dominica, St. Lucia, Grenada, St Vincent and The Grenadines) together produce less than 2% of the world's bananas, yet this did not stop the big boys from trying to wreck our economies. 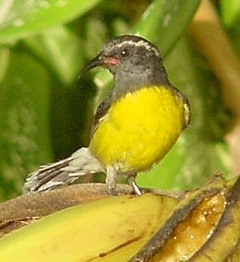 Having made massive contributions to both American political parties, the payback came when the U.S. Government lent on the WTO (World Trade Organization), which in turn lent on the EU (European Union), to try and prevent the UK giving our islands preferential status with regards the supply of bananas. 'Preferential Status' did not mean that our bananas were being subsidized in any way, merely that they were allowed access to the British market even though sold at a higher price than the Central American bananas. When one enters the fruit section of a typical UK supermarket, there may be one area selling bananas at 39p per lb, whist nearby are Windward Isles or Fairtrade bananas on sale at a higher price. It is the consumer who makes the choice and many consumers will tell you that they prefer the Windward Isles bananas and are willing to pay more for them. One of the Central American countries where the American farm giants grow their bananas is Honduras. In June 2009 the democratically elected leader of Honduras, Manuel Zeleya, was deposed in a coup even though he had less than a year left to serve in office. This attracted only scant coverage in the international media and few people appreciated the significance or understood the implications until John Perkins (author of New York Times best seller "Confessions of an Economic Hitman") provided an analytical insight into the situation in an August 2009 newsletter (see ). It has much to do with the banana market. This is politics way beyond our sphere of influence and is very disturbing. Meanwhile, a once prosperous banana industry in Dominica has been in a continued state of decline since its peak year, 1988, when 72,000 tons were produced on 15,000 acres of cultivation by 7,000 growers. Today this figure has dwindled to around 12,000 tons and the income received by the farmers barely covers their costs. When farmers have been growing the same crop for several decades, however, they almost forget the wide range of crops they used to grow and are not easily persuaded to change track and to diversify. Dame Eugenia Charles, Dominica's Prime Minister from 1980 to 1995, recognized the trend in the early 90's and her public addresses were often aimed at persuading Dominica's banana farmers to diversify. A few responded but the majority doggedly persevered or else gave up altogether. 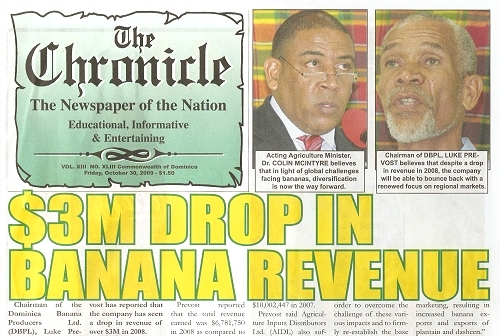 The next Prime Minister - Edison James, himself a banana farmer and one time manager of the DBMC (Dominica Banana Marketing Corporation), did more to encourage rather than to dissuade the banana farmers, though this did little to check the market's continued contraction. A few years ago the DBMC, which had continued to spend the way it always had but with dwindling income, found itself in serious debt and had to be dissolved as a result. It's successor, the DBPL (Dominica Banana Producers Limited) recently found itself competing with another organization - WIBDECO (Windward Islands Banana Development and Exporting Company Limited) and the two are now frequently at loggerheads with each other. Meanwhile, it appears that America's banana giants have got their way in the end. 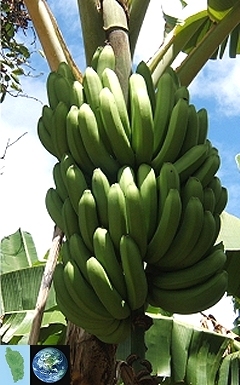 In October 2009 it was announced that The Windward Islands' guaranteed fixed share of the European banana market is being abolished! This could be the final nail in the coffin for many of Dominica's banana farmers, but in the long term it may prove to be a blessing in disguise. 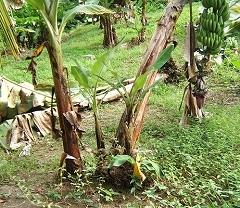 The variety of banana grown in Dominica for export (there are over 160 varieties of banana grown world-wide) tends to grow too tall with insufficient root support for our climate and has a tendency to keel over under the weight of its own fruit if not supported. Each bunch of fruit must be enclosed in blue cellophane to aid the ripening process and prevent our local birds from pecking it once ripe. Chemical fertilizers are often used to speed up growth, fungicides are used to control a disease called 'leaf spot' and a dangerous herbicide, Gramoxone (banned in many countries for causing cancer), is nevertheless still peddled to developing nations like ours and is used routinely by many Dominican farmers to clear the land before planting. These substances take their toll on the environment and on the health of farm workers. 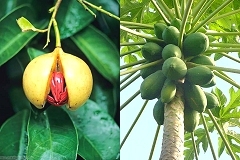 There are, however, many fruit crops which will grow easily in Dominica without requiring any of these harmful agro chemicals - most citrus fruit, avocado pear, nutmeg, pawpaw, soursop, pineapple, guava, carambola, passion fruit are just a few examples. The banana boats still sail to the UK every fortnight from Dominica. If the banana quota remains unfulfilled, what space remains could just as easily be utilized with other types of locally grown fruit or veg. All the better if they are grown organically, appealing to the increasingly raised awareness of the British consumer. 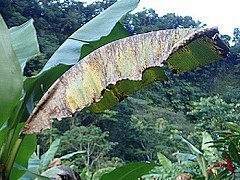 September 2015 update: A very wet 2013 saw what remained of Dominica's bananas devastated by an airborn fungal disease known as black sigatoa, which thrives in damp conditions. It affects the leaves, which turn yellow and black then die. The resulting fruit is much smaller and ripens very unevenly. Only small pockets of bananas farmed with the heavy use of fungicide spray have been successfully grown since. Pawpaw trees have been similarly effected during prolonged wet weather, withering from the top down. I believe man made climate change to be the cause, as for every 1 degree of global warming, the atmosphere can absorb 4% more moisture. It is now about 10 years since our population of mountan chicken (a very large frog) was decimated by a similar airborn fungal disease which contaminated their skin. Only about 5% of the population survived. This was not particular to Dominica as frog populations throughout the world have been afflicted in this way. To add further injury to the remnants of our banana farming, in the early hours of Thursday, 27th Agust 2015, Tropical Storm Erika passed slowly over the island, dumping a staggering 15 inches of rain in less than 12 hours. 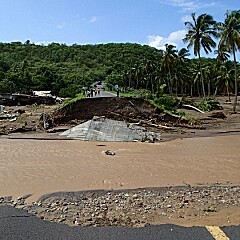 The magnitude of this deluge has never before been seen in Dominica. Every river and stream became a raging torrent, destroying roads and bridges, causing landslides, flooding homes and washing away vehicles, trees and people. Approx. 65 people lost their lives. The whole island was disected. The cleanup has begun but the repairs needed to restore the infrastructure will be a massive task. Many who witnessed Hurricane David in 1979 say the extent of damage caused by Erika is greater and will be more costly for this tiny nation to repair. Man made global warming is now undisputed, yet western governments continue to act irresponsibley in their ever growing pursuit of fossil fuel extraction and consumption, even using unprofitable practices such as fracking, which currently costs far more to extract than it can recover in sales and only breaks even when the oil price is around $35.00 per barrel higher than it is priced in today's global marketplace. John Perkins, himself a one time 'economic hitman' (priming the leadership of lesser developed nations for corporate exploitation and economic subservience), wrestled with his conscience till eventually revealing all in these two excellent New York Times bestselling books. Though written and published in the U.S.A., you will be lucky to find them on display on the bookshelves of any of the well known American book stores. We must be thankful for the internet!